Car sales in America - the world's second-largest market - are stalling, but there's debate about whether the downshift is due to normal economic cycles or a sign of bigger changes. 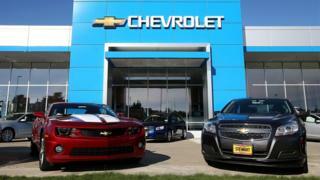 Major firms, such as Ford, General Motors and Toyota, have reported sales dips in the first half of the year. They come after a record 17.55 million cars, SUVs, minivans and pick-up trucks were sold in 2016. Forecasters expect US sales to fall to about 17 million this year, as demand recedes after years of increases. Sales growth in previous years was boosted by unusually low borrowing costs and pent-up demand, as cash-strapped households delayed purchases during the economic downturn around 2009. "That was not sustainable forever," James Lentz, the chief of Toyota North America, told the BBC's Michelle Fleury. America - where more than 90% of households own at least one vehicle - is known for its car-loving culture, suburbs and weak mass transit. But the 2016 record for new car sales wasn't that much higher than the 17.4 million peak set in 2000 - even though the US has 42 million more people, and carmakers were offering buyers generous incentives. With technology set to transform driving, and more and more people around the world living in dense, traffic-logged cities, the slowdown could be a warning that carmakers face a bigger problem. "There's a pretty general consensus that this recent phase of elevated auto sales is coming to an end, and really the question is whether it's going to end with a hiss or a pop," says Tony Dutzik, a senior policy analyst at Frontier Group, a liberal think tank. Until the economy contracts more broadly, there's unlikely to be a dramatic sales decline in the US, says Katherine Davidson, a London-based global sector specialist for the asset manager Schroders. But growth in the long term is more unlikely, she says. "Whether we have passed peak forever in the US is I think the bigger debate," she says. "It's entirely possible we have seen the best years of the US auto market." One theory used to explain stalling sales growth in the US is that younger Americans, who were hurt disproportionately by the economic crisis, are waiting longer to buy cars, just as they are waiting to make decisions about marriage, homeownership and child bearing. The average age of buyers of new vehicles in the US increased about seven years between 2000 and 2015, and is now around 50, though the precise number varies depending on the survey. "I think the way Americans move through their life stages is changing a little bit," says Stephanie Brinley, a senior analyst at IHS Markit. 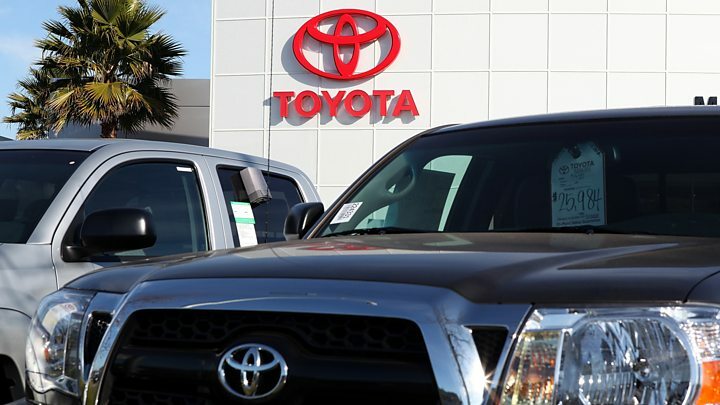 As the US economy improves and the generation knocked by the recession ages and regains its economic footing, it will help sustain car sales, says Mr Lentz, of Toyota. "We're very, very bullish on Gen Y and the car industry," Mr Lentz told the BBC, referring to the generation, also known as millennials, often defined as being born roughly between 1980 and 1994. Indeed, the share of purchases by buyers born between 1977 and 1994 has already increased from 21% in 2012 to about 29% today, says Thomas King at JD Power, a marketing information services firm headquartered in California. The growth paused this year as credit tightened amid concerns about too easy car loans, but Mr King expects it to increase over the long term. But he says carmakers shouldn't rely on younger buyers to drive new sales. He says they're already part of the market, getting access to cars through family help and other means. "Even if they're not out there registering ... it's still very clear that they're influencing car sales, and still driving vehicles around on roads today," he says. Yet Gen Y's level of future purchases is also hard to predict because of bigger changes, says Mr Dutzik of Frontier Group. This generation is the first to enter prime car-buying years with e-commerce and ride hailing services such as Uber and Lyft widely available, he says. "You have a set of folks right now ... who have before them a range of options that have been available to no previous generation," says Mr Dutzik. "The question is how is it going to change [their decisions]? And that's something I think we're still learning." For carmakers, the future is especially hazy, since car-sharing firms might step up their purchases, even if future households scale back, he added. Mr King of JD Power says he expects US sales to remain at about the current levels over the next few years, thanks in part to financial incentives for buyers. "Overall the demand [from regular households] still remains very high from a historical perspective, and the rate of decline is very, very modest," he says. Mr Lentz, of Toyota, also expects a plateau. But some companies have told investors they are ready for a sharper contraction. Chuck Stevens chief financial officer at General Motors, said in April: "We are very cognizant of that we operate in a cyclical industry, and we're eight years into expansion, and it's not like we're sitting and waiting for a downturn to be prepared." A 2016 McKinsey report predicted the annual growth rate for global car sales would slow to about 2% by 2030, due to economic factors and increased use of taxi and car-sharing services. Ford, General Motors and Fiat Chrysler are among the firms that have announced layoffs in recent months. Companies are also shifting resources away from the US and Europe to markets such as China, where a growing middle class is predicted to drive strong growth. But there are risks in those markets too, as rapid urbanisation and traffic jams keep demand for cars in check. "We believe forecasters have overstated demand growth expectations for the global car fleet, by failing to factor in the impact from population density and congestion in emerging market urban areas," analysts at LGIM wrote in a note in June. One thing is certain, Ms Brinley of IHS Markit says: "It's a cyclical industry. It always has been."